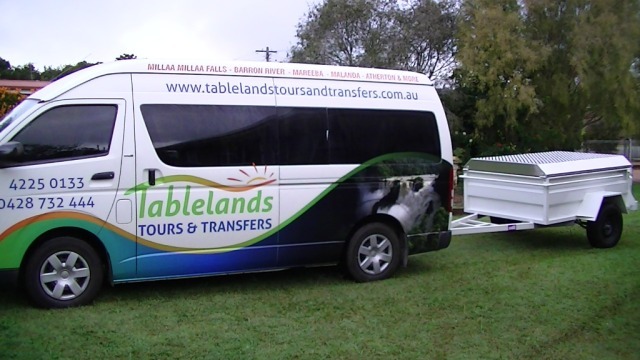 The Tablelands Waterfalls Tour is also one of the most scenic tours in Queensland an gives you a comprehensive Tablelands experience. We begin our journey from Cairns around 7:30 and make our way up the Kuranda Range to the scenic Tablelands. 1st stop is Malanda to the ancient Curtain Fig tree. 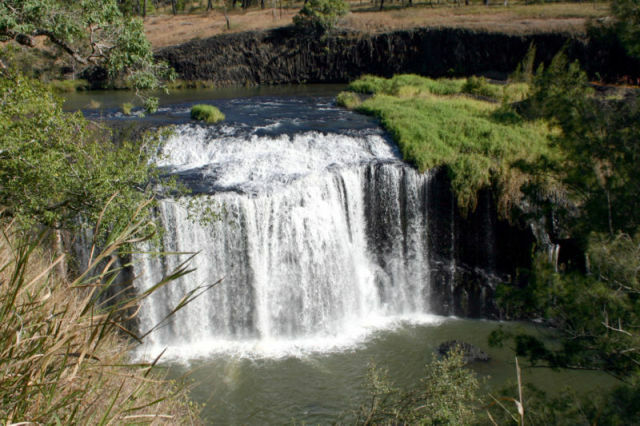 From here we tour through the rich volcanic soils famous to the Tableland farming district, arriving 10 minutes later at our second stop Malanda Falls. After sharing in the sights and history of the falls we make our way through the township of Malanda briefly stoping into the Dairy centre to purchase or taste some of the local produce, then we head towards Millaa Millaa lookout for a brief photo shoot of the rolling green Tableland pasture, before arriving at the renowned Millaa Millaa Falls. 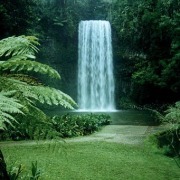 These falls are without a doubt the most photographed on the Tablelands and possibly Australia. 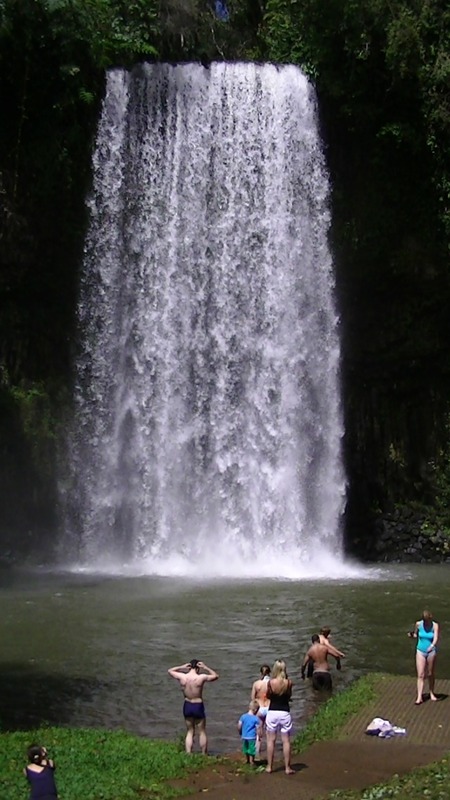 This is a great spot for a swim, as the swimming hole is reasonably safe, and there are toilet and change room facilities on location. Keep an eye out for the vivid blue flicker of the spectacular Ulysses Butterfly against the background of the cool misty breeze coming off the creek. 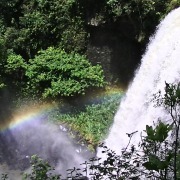 From here we make the short ten minute drive to Zillie Falls, the viewing platform takes you right to the side of the falls where you may have the welcome addition of catching a rainbow in your picture. 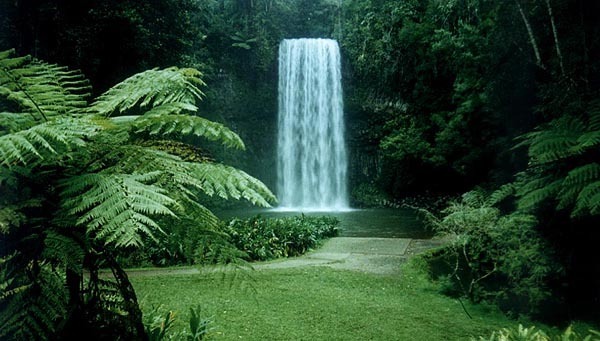 Following this exhilarating experience we travel to Ellinjaa Falls, only 3 klms down the road. Ellinjaa Falls cascades over a series of lava columns making for some very nice photos. 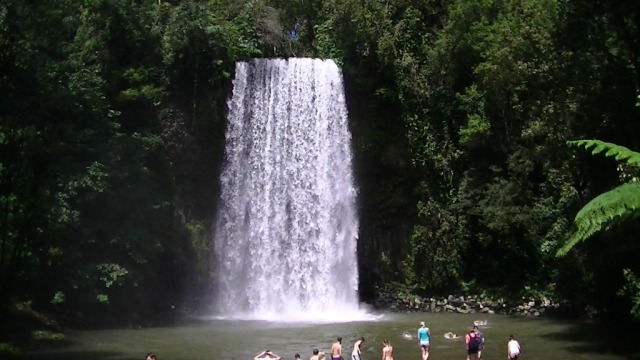 Here you will walk through the rainforest down the zig zag track to the base of the falls observing a wide variety of lush tropical rainforest plants and birdlife on the short descent. Take time for a brief rest, as we travel onto the Palmerston Highway, towards Mungalli Falls, and the famous 100% organic Mungalli dairy. 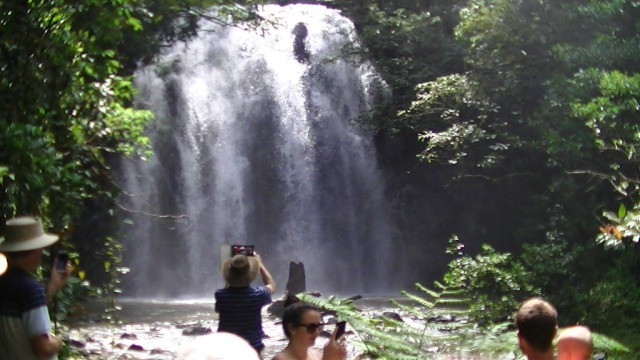 Here you will be treated to a view of the highest waterfall on the Tablelands at 90M in height, time permitting take the 35 min round trip walk to the base of the falls, for a brilliant photo opportunity. We’ve really been in and out of the vehicle to this point, taken in some spectacular views and breathed in lots of fresh mountain air. 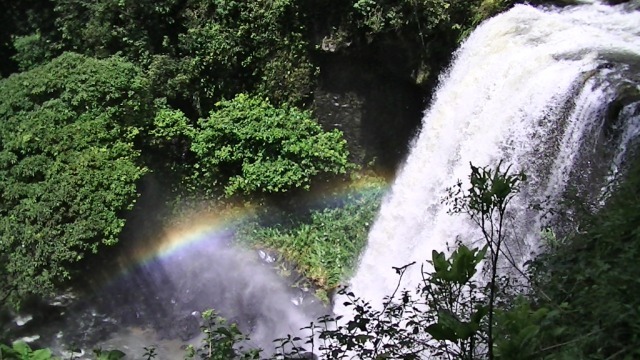 Now it’s time to relax and recharge with a delicious all inclusive lunch of your choice at the Millaa Millaa Café. Then you will have time to take in and appreciate all that the Tablelands has to offer as we wind our way across the old Palmerston hwy to Ravenshoe. 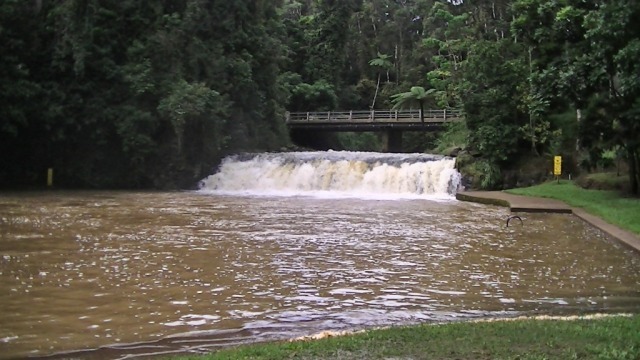 Here we will have a brief chance to stop in Queensland’s highest town before a short drive to the famous millstream falls. Queensland’s widest single drop waterfall ….. With our camera card’s nearly full we begin our way back to our starting point in Atherton, but not before one final spectacular stop at Mt Hypipamee National park where we view the breathtaking “Crater” a 60 mtr wide and 80 mtr deep volcanic vent crater. 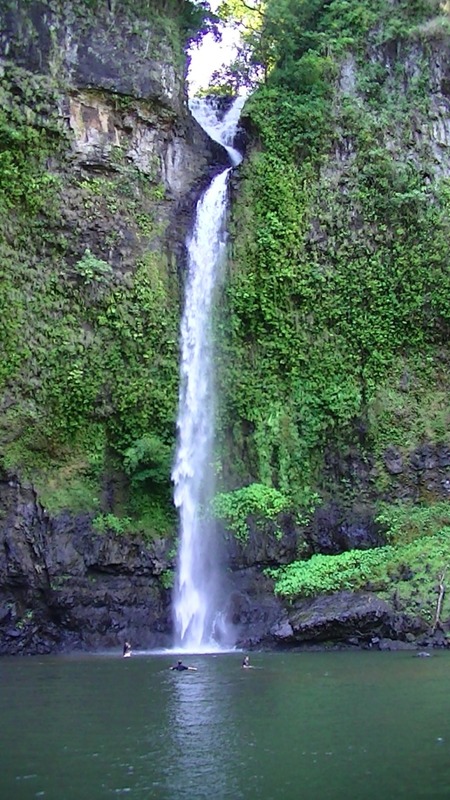 Take the return track to the car park down to the Dinner falls, our final water fall viewing for the day. Now you can say you have seen the very best of the tropical side of the Tablelands as we wind our way back across the Herberton ranges to our starting point nearly 7 hrs ago.